The Food Section will be on hiatus while we head to the warmer climes of Curaçao for a respite from the winter cold. Regular posting will resume on January 3. 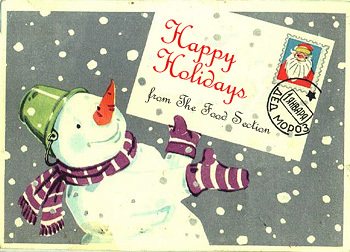 Best wishes for a happy holiday and New Year! Special thanks to Mazaika.com for the postcard upon which this image is based. The nominations for the 2004 Food Blog Awards have been announced, and The Food Section is a nominee for Best Site Design and Best Food Blog - Food Industry. My thanks to those of you who nominated this site! The competition, launched by Kate at The Accidental Hedonist, recognizes food blogs across 16 different categories. To vote, head to The Accidental Hedonist and make your selections known at the poll located on the upper right corner of the page. The voting period will end at the stroke of midnight on December 31, 2004. Here's a chance to recognize your favorite food blogs and learn about a few you may not have known about before. May the best blogs win! This edition of Agenda will be the final installment for 2004. The ancient Jewish Christmas ritual of eating Chinese food and going to a movie on Christmas will be transformed into a full-fledged event at Makor's Stiller, Brooks and All-You-Can-Eat Chinese on Christmas Day. The evening will feature Chinese food and screenings of The Royal Tenenbaums (8:00 p.m.), Zoolander (10:00 p.m.), Blazing Saddles (8:00 p.m.), and Young Frankenstein (9:45 p.m.): Saturday, December 25, at the Steinhardt Building, 35 West 67th Street. $30.00/person (212.415.5500). 1. Wok Hay: The Breath of a Wok, an exhibition of wok styles and photographs exploring wok culture, through December 23 at the Asian/Pacific/American Studies gallery at New York University, 269 Mercer Street, Suite 609 (212.998.3700). 2. Have You Eaten Yet? The Chinese Restaurant in America, an exhibit exploring the Chinese restaurant’s origin and growth in America and its cultural significance, at the Museum of Chinese in the Americas (70 Mulberry Street, 2nd Floor). The exhibit continues through June 2005. Suggested admission is $3 (212.619.4785). 3. Cookin': A Sizzling Entertainment, "a fast-paced kitchen percussion show combining comedy, rhythm, and non-verbal performance," at the Minetta Lane Theatre, 18 Minetta Lane (212.420.8000). I want to thank Kristin Franklin for a fantastic job guest-editing The Food Section last week. From burgers to barbecue, mole, and persimmons, her Moveable Feast provided a very informative and personal take on the Los Angeles food scene. In the process, this unabashed L.A. "newbie" unwittingly waded into one of the more important culinary debates of our times -- can one order fries "animal style" at In-N-Out, or are they just an urban myth? Ms. Franklin promises to do some investigative work and get back to us with an update. »Keller Heads South . . . I have had loads of fun this week. Thanks so much to Josh and The Food Section for giving me this opportunity. I especially appreciate all of the comments posted. I will be sure to continue my burger tour starting with the recommended Sunset Grill, Astro Burger, and Pie-n-Burger . . . and I'll be certain to try the fries "animal style" next time I get a hankering for a double-single at In-N-Out. I've also since heard that The Counter in Santa Monica is a fun, interactive burger place. Thank you! Just as there is so much to eat in L.A., there is so much to read about eating in L.A. For me, the first magazine in my hands in Los Angeles has been a guide to gluttony. I leave you with a few sources which I've found helpful, entertaining and just plain fun to read. Los Angeles Mayor James Hahn graced the cover of the September 2004 issue of Los Angeles Magazine, but what really caught my eye was the top bar line: "The 25 Best Mexican Restaurants." I was excited to get this issue in my hands after I relocated to Los Angeles, where taco stands rival burger joints, this past September. I use it as somewhat of a guide to the Mexican food around here; I try to keep it in my car. But at the same time, this article only highlights 25 out of the overwhelming thousands that are out there. I have found one favorite so far, thanks to Patric Kuh (who wrote the article): El Sazon Oaxaqueno. This family-run place in Mar Vista shares a small strip mall with a laundromat and an abandoned 98-cents store. I haven't tasted many moles in my life, but I know I'm getting the real thing when I inhale the delicious Enchiladas de Pollo with black or red mole from El Sazon. The sauce is complex and sensual, with deep chocolate and chili flavors. And, if you're lucky, sweet bread will be baking as you're waiting for your lunch order, almost ready to fill the bakery cases at the front of the small restaurant. On the Mexican food note, I noticed online that Jonathan Gold (L.A. Weekly) recently published an article titled Nueva York, which highlights seven Mexican restaurants on one street, York Blvd. I'll have to try . . .
Other links also provide direction, entertainment, and/or proven good reads. The Los Angeles Times Food Section is extensive, publishing loads of articles weekly on all things cooking and eating and drinking. Or if you'd like, you can goo-gah over L.A.'s hottest chefs at L.A.com's dining section, while finding out where to eat when you shop or whether you should bring Fido to dinner. Gayot.com's Los Angeles Restaurants section keeps tabs on restaurant openings, renovations, and closings. The page also features a reliable guide, although seemingly limited, to upcoming and ongoing food events in the city. The hip Los Angeles City Beat, an "underground"-looking online counterpart to its newsstand publication, provides a small but intriguing "Eat" section. A few blogs have come across my path during my research. LARitz, a personal, witty, everyday life blog based in Los Angeles, devotes many posts to explorations of food and restaurants around town, mapping noteworthy meals from Campanile to Pollo la Brasa. Franklin Avenue intertwines L.A. food adventures with life adventures, coming to you from Mike and Maria, who I'm guessing are the coolest couple to hang out with in Los Angeles. EatLa, although appearing to have stopped publishing articles a year ago, contains entertaining documentations of contributing writers' restaurant adventures. 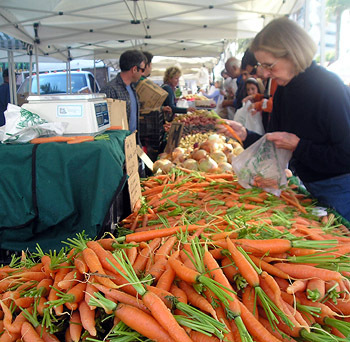 In EatingLA, a more updated blog not to be confused with the one previously mentioned, Los Angeles resident and food-enthusiast Pat Saperstein becomes tour guide to "eating out, cooking and shopping for delicious foodstuffs in the city of the angels." Her articles range from pastry shop openings to documenting eating out with Chowhound's editor. Low End Theory's Guide to L.A. Restaurants allows searches by neighborhood, "style," or cuisine. The site is relatively young (October 2004), but the rich content so far merits reason to return. Orange County-based blog Professor Salt explores Orange County spots while sharing stories of home barbeque. Quite the specialized site, Hot Dog Spot with its wacky "crack team" is on a mission to find the best hot dog in Los Angeles, hence documenting their dog-licious journeys. I look forward to making these sources daily reads for daily eats. I'm sure I've missed a few, so please feel free to tune me in. We've got the hot dog; any L.A. mole blogs out there? During my time thus far in this enormous city, I have experienced three "gems," places which I have returned to and will return to in the near future. This list being limited to the Westside, I realize I haven't fully tapped the heart of the city and its intricate regions, which is an entire treasure chest in itself. And I know the greater L.A. (the valley, etc.) houses gems from Encino to Arcadia and south. This is just my starting line. Appropriately dubbed “Chef’s Paradise,” the long-standing Surfas of Culver City not only caters to the equipment needs of local restaurant kitchens and professional chefs, but also throws the passionate home cook into a state of gastronomical giddiness. Although most home kitchens lack counter space and electrical support for $750 Robot Coupes, industrial Belgian waffle makers or 40 lb fat-capacity deep fryers, Surfas welcomes the public to enjoy wholesale prices on all kinds of (more practical) kitchen gear. Cookware, cutlery, tools and gadgets fit for restaurant use are available to the public without the Williams-Sonoma-esque prices attached. Recommended deals include 1/2 sheet pans (13” by 18”) for $4.50 and a variety of kitchen toys such as stainless-steel tongs, large spoons and heat-resistant spatulas for stocking up, as well as Japanese mandolines and all things fit for sushi to baking to pasta-making. The gourmet and specialty foods section, which offers imported goodies such as olive oils, canned plum tomatoes, vinegars, natural peanut butters, flours, and mustards among others, is sure to inspire and, in my case at least, make for extended perusal. Surfas is located at 8825 National Blvd. in Culver City just south of Venice Blvd. Original Tommy’s: There’s nothing special about the bun. The patty is small, requiring complaining carnivores to order a double or triple. The fixings are simple and always the same: tomato slice, chopped onion, mustard, optional cheese. The fries are mediocre but serve one special purpose: to sop up excess chili. Without this generous slopping of gooey, original recipe chili on your burger, you don’t have a Tommy’s. Since 1946, the original Tommy’s has remained put on the corner of Rampart and Beverly. It’s the only Tommy’s (out of 27 locations) that doesn’t provide fountain drinks; customers help themselves via the honor system to cans of soda out of several Pepsi coolers surrounding the stand. Here’s what I’ve learned from the Tommy’s experience: don’t entirely remove the Tommy’s burger from the wrapper. If this mistake is made, all the chili will ooze out the bottom of the burger and meld into an even sloppier mess, creating chili-cheese paper which requires some serious fry-mopping. The Food Section in Bon Appétit! We're taking a very brief intermission from the regularly scheduled programming to deliver some exciting news. 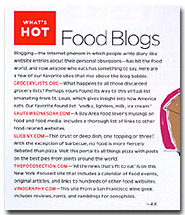 I was surprised (and also pleased) to discover that The Food Section is featured in a round up of food blogs in the January 2005 issue of Bon Appétit. The brief article, included in an issue of the magazine devoted to "What's Hot," "What's Not," and "What's Next," mentions The Food Section, The Grocery List Collection, Sauté Wednesday, Slice, and Vinography. Congratulations to all on the recognition, and special thanks to Bruce Cole at Sauté Wednesday and Adam Kuban at Slice for cluing me in to this major media moment. I know what you’re thinking. Yes, the Veterans Affairs campus is the last place I would have thought of to enjoy delicious barbeque while listening to a local jazz band. But following a recommendation from a former co-worker, a few Fridays ago my boyfriend and I found ourselves with trays in hand, waiting in a small line at the Veteran’s Village Diner on the VA campus in Westwood. And here’s the kicker: they smoke their own chicken and ribs. I knew the barbeque would be good even before I had my first messy bite. As we walked toward building 306, I spotted the two horizontal capsule-like smokers on the perimeter of the large outdoor patio. 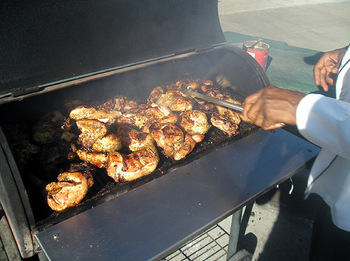 Manned by barbeque guru Earnest "Pork Chop" Phillips every Friday, the smokers slowly complete the cooking of the ribs and chicken as well as infuse them with a char-like, smoky flavor. The heat is controlled by manually opening and closing the lids, a skill which Pork Chop has delightfully mastered, considering his 35 years experience with everything barbeque. The fall-off-the-bone ribs and crisp-skinned chicken are then slathered with a tangy house-made (yes, house-made) barbeque sauce in the kitchen before brought to the cafeteria line for service. For $6.50 each, we enjoyed our choice of ribs or chicken, two sides, cornbread and a piece of cake. Oh, and the sides are all house-made as well, from rich, comforting macaroni-n-cheese to tender collard greens and tangy potato salad. Keller Heads South . . .
. . . But, unfortunately, not to open a new restaurant. When asked by an audience member whether he will ever plan to return to L.A. and launch a Southern California sister to his Napa Valley French Laundry or Bouchon, chef Thomas Keller, who just opened Per Se in New York, responded with an emphatic “No.” And then he gave Roscoe’s Chicken & Waffles and In-N-Out some props. At noon sharp on Friday, November 12, L.A. Times food writer and author Russ Parsons began the interview, flanked by Keller and Jeffrey Cerciello, Keller’s chef at Bouchon. 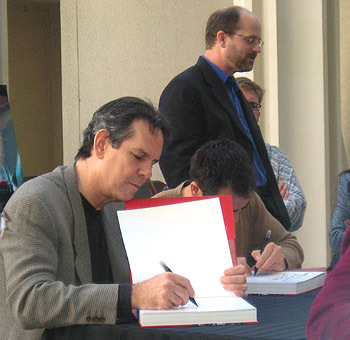 The setting, casual yet sophisticated, was in the courtyard outside the Los Angeles County Museum of Art's Bookshelf, quite fitting for the promotion, Q&A, and book-signing for Keller’s second cookbook, Bouchon, named after his Yountville, California and now Las Vegas locations. The event was promoted as a supplement to an art exhibit at the museum, From Renoir to Matisse: The Eye of Duncan Phillips, but devoted home cooks and Keller fans, with cookbooks in hand, filled limited seats while others stood, clearly attending for the interview and book signing. I was lucky enough to attend on behalf of The Food Section. As a professional cook and one who has merely peered through the outside windows of the French Laundry, I have always regarded Thomas Keller as untouchable, transcending the title of just “chef.” Genius, perhaps. Master. Perfectionist. But here at the interview, Keller was ten feet away, talking about Bouchon. For me, it brought Keller back to earth.